We sometimes think of the prodigal as the one who abandons family. But the meaning that applies to this story is “recklessly spendthrift”. 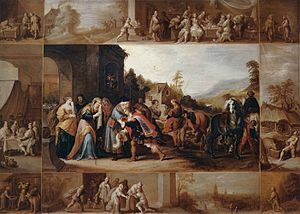 The prodigal son (Luke 15:11-32) shames himself by indiscretion and then sinks about as low as possible in his culture. That humiliation reflects upon the Father, his own brother, the whole family, even the village or clan, not to mention the financial blow inflicted by self-pleasuring sin. The prodigal could justifiably lose the rights to belong to the family any longer. No one would question a Father who disowned such a disgrace. Note that no one in the family of this story has a name. Not only does that make the story applicable to anyone, it has impact as story. Without a name no one in the story has legal standing. No one has control over another because that comes from using a name. (Call someone by name on the street and watch them stop and turn; that’s control, even if on a small scale). And the family supercedes culture, even though the original listeners would certainly have understood all the implications in the context of a Jewish society. One feature of that culture hammered this story so deeply into the soul of the first century listeners that it has to be noted for our modern western sensitivities. When I first came upon this fact it really rattled my soul. No adult male in the culture of Jesus’ time here on earth would ever run to meet or greet someone in public. In mild terms such an act was undignified. Yet with unbridled love and complete disregard for social niceties the Father runs to welcome home the son who was such a disgrace. Many parents would see that child as a “disappointment”. But Father could not contain the joy of seeing the child who had left and became lost to Father and family. On the return the family became restored, intact. Imagine! The return of that slimy little sinner who wasted an entire inheritance on drugs, drink, fornication and missed opportunities restored the family back to balance. admission of error and sin and walking back to where it all began and where one really belongs – the family of God. Let it sink in, shake up your neat little world of doctrine and undercut all your treasured standards. Humans throw unacceptable humans away. Forgiveness is so rare a commodity in religious circles I have trouble finding anyone who has seen it in their congregation. Son sins. Son senses sorrow. Son seeks shelter. Son says, “Sorry”. If that doesn’t bring you to tears, listen to the song “When God Ran” by Phillips, Craig and Dean. Weep with repentance. Or weep with joy that you already came back.